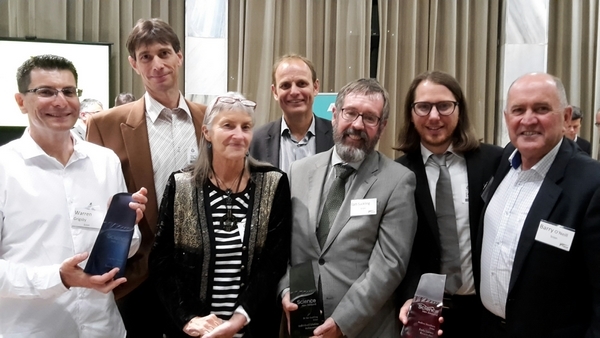 The second Science New Zealand awards, held on 8 November at Parliament Buildings, brought together highly talented scientists from all seven Crown research institutes, including Scion. Awards were presented in three categories to awardees from each institute. Acknowledged for his 40 years in science, Dr Ian Suckling was the Scion recipient of the Individual/Lifetime Achievement Award. Ian began his career at the then Forest Research Institute as a scientist in the Wood Chemistry Group and progressed to leadership roles in areas covering fibre cement pulp, fibre optimisation and biofibre products. In 2010-2012 Ian represented New Zealand in the international bioenergy sector, specifically on commercialising liquid biofuels from biomass. During 2013-14 he led a $13.5 million programme co-funded by the MPI Primary Growth Partnership, Norske Skög Tasman and Z Energy, with Scion providing research and technology support. Over the last two years, Ian has led the ‘New Zealand Biofuels Roadmap’ project. Andrea Stocchero received the Emerging Scientist or Engineering Award for Scion, in recognition of his significant contribution to the timber, building and design industries. As Scion’s only sustainable architect, Andrea’s research focus is to achieve high sustainability targets through the use of wood and other biobased materials. Last year, Andrea was invited to speak at the UN Food and Agriculture Organisation representing New Zealand and the international timber design and construction sector, and in February this year he presented at a follow-up meeting in Rome. Andrea is also part of the Toitū te Kāinga, Toitū te Ora, Toitū te Tangata (Sustainable Homes, Healthy People) project led by Toi Ohomai Institute of Technology for the Te Whaiti community and recently he worked with Kai Rotorua on living building requirements to benefit the region with regard to healthy eating and health. The Science Impact Award for Scion was presented to the Ligate™ Team represented by Dr Warren Grigsby and Armin Thumm. The bioadhesives team, comprising chemists, polymer scientists, technologists and commercial managers, developed a globally recognised new technology that has been described as a “game changer for wood panel manufacturers”.